Agriculture is one of the sectors that has greatly benefitted from the establishment of climate services. In Colombia, interannual climate variability can disrupt agricultural production, lower farmers' incomes and increase market prices. Increasing demand thus exists for agro-climatic services in the country. Fulfilling such demand requires robust and consistent approaches for seasonal climate forecasting. Here, we assess seasonal precipitation predictability and forecast skill at agriculturally-relevant timescales for five departments that represent key growing areas of major staple crops (rice, maize, and beans). Analyses use Canonical Correlation Analysis, with both observed SSTs and modeled (NCEP-CFSv2) SSTs, as well as with CFSv2 predicted precipitation fields (through a Model-Output-Statistics analysis). Some 74.4% of the forecast situations analyzed (5 departments ∗ 4 seasons ∗ 3 predictors ∗ 3 lead times) showed correlation-based goodness index (Kendall’s tau, ) values above 0.1, 38.8% above 0.2, and 18.8% above 0.3. Predictability was limited towards eastern Colombia, and during wet periods of the year in the Inter-Andean Valleys. Importantly, results were consistent between ERSST and CFSv2-driven forecasts, implying that both can offer valuable outlooks for Colombia. While our study is a first important step toward the establishment of a sustainable and successful climate service for agriculture in Colombia, further work is required to (1) improve seasonal forecast skill; (2) link seasonal forecasts to agricultural modelling applications; (3) design appropriate delivery means; and (4) establish stakeholder-driven processes that allow two-way communication between forecast issuing institutions (e.g. IDEAM–Colombian Meteorological Service) and famers’ organizations and farming communities. Esquivel, Alejandra; Llanos-Herrera, Lizeth; Agudelo, Diego; Prager, Steven D.; Fernandes, Katia; Rojas, Alexander; Valencia, Jhon Jairo & Ramirez-Villegas, Julian. (2018). Predictability of seasonal precipitation across major crop growing areas in Colombia. 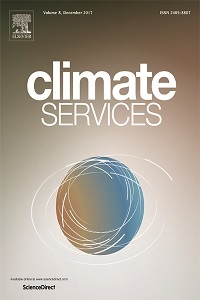 Climate Services, (March), 1-12 p.